In order to address the lack of reliable statistical data in most companies , the digital agency People Input, has implemented a technology solution called ProCollect , a modern data collection system that enables companies to collect, process, analyze and digitize statistical data in record time. 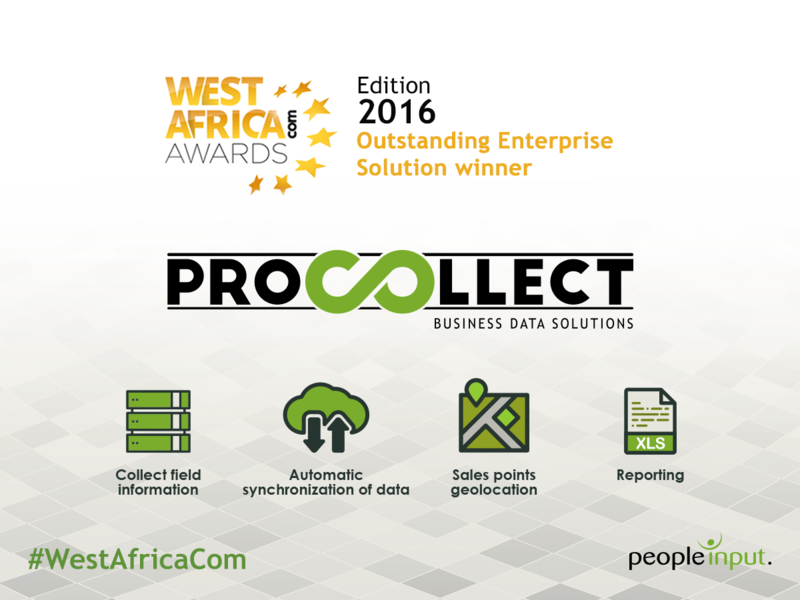 ProCollect was awarded "Outstanding Enterprise Solution " at the 2016 edition of the West Africa Com Forum, the largest Telecom & Digital event in West Africa . The awards came following the vote of a panel of judges consisting of experts in the business of digital at the West Africa Com Awards. ProCollect provides opportunities for companies to have real-time market information, reliable management of sales, marketing , surveys and field studies, which help professionals make business decisions. "African markets face a clear lack of reliable statistical data. Our ProCollect Solution is THE answer to this need" said Serigne BARRO, CEO of People Input. "With ProCollect, any business company can, at short notice, get an affordable turn-key solution for collecting, geolocalizing and analyzing data. ProCollect works on any mobile device (smartphone or tablet). Once the device is connected to the Internet, it synchronizes in real time all the information entered. Several big agribusiness and distribution companies use ProCollect each day to get reliable real time marketing and commercial data on sales management, opinion polls, field surveys ... ProCollect revolutionizes the information gathering system!". ProCollect was developed in 2015 by the People Input Lab. It helps any entity collect, store, enter and process data more easily. ProCollect is a robust and customizable solution, and proves to be an excellent tool for informed decision making. It enables the user to gain plenty of time and to store data on a secure server that is accessible via a dedicated web-based interface.